Imagine sharing the same devotional with more than 1.5 million believers — in over 50 languages and dialects around the world! Sound impossible? Not at all. The Daily Texts have been living this ecumenical dream for more than 250 years. First published in 1731 in Saxony, this little book grew out of a spiritual renewal of the Moravian Church (Unitas Fratrum) that dates back to August 13, 1727. In those days, Count Nicholas Ludwig von Zinzendorf handed out a Losung, or "watchword," for the next day to each member of the Moravian congregation at Herrnhut, Saxony (now Germany). Thereafter one or more persons in the congregation went daily to each of the thirty-two houses in Herrnhut to bring them the watchword for the day. Today the biblical texts for each day continue the tradition, being chosen in Herrnhut, Germany, and then sent around the world to those who prepare the different language editions. In this edition, hymns are chosen and prayers written by Moravian clergy and laypersons from the United States and Canada. Each month is prepared by a different person or couple so that the prayers reflect the great diversity of devotion in the Moravian Church. Membership of the worldwide Moravian Church is over 750,000 in 19 provinces. The Daily Texts has a press run of over 1,000,000 copies in the German language alone, which far surpasses the 30,000 members of the Moravian Church in all of Europe. Other language editions bring the total circulation of this devotional to over 1.5 million copies. The American edition has traditionally added an appropriate hymn verse after each Scripture passage, but these have been omitted here due to copyright considerations. 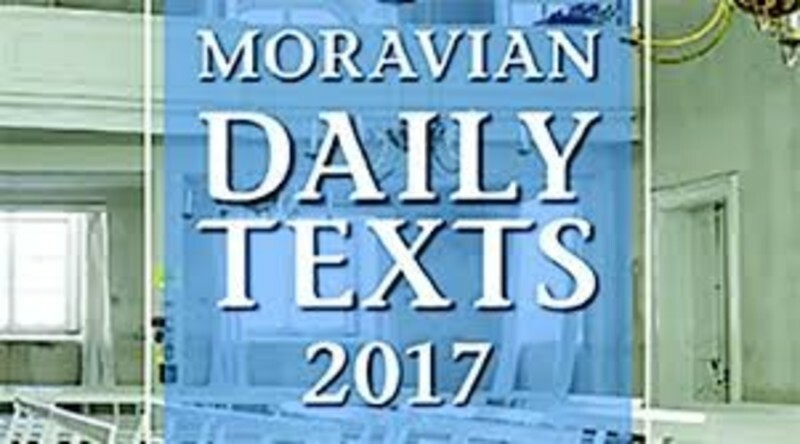 Sign up for the Moravian Daily Texts email service, or order your own copy of the Moravian Daily Texts. Please note: If your email provider has spam blockers you may have to add pubs@mcnp.org to your address book in order to receive your Daily Texts email subscription.